Today's top 5 picks are all about hair. Obviously these products are the ones that work best for me. I have naturally wavy, dry, frizzy hair so I go for products that help smooth it out. These 5 have outlasted many trials. 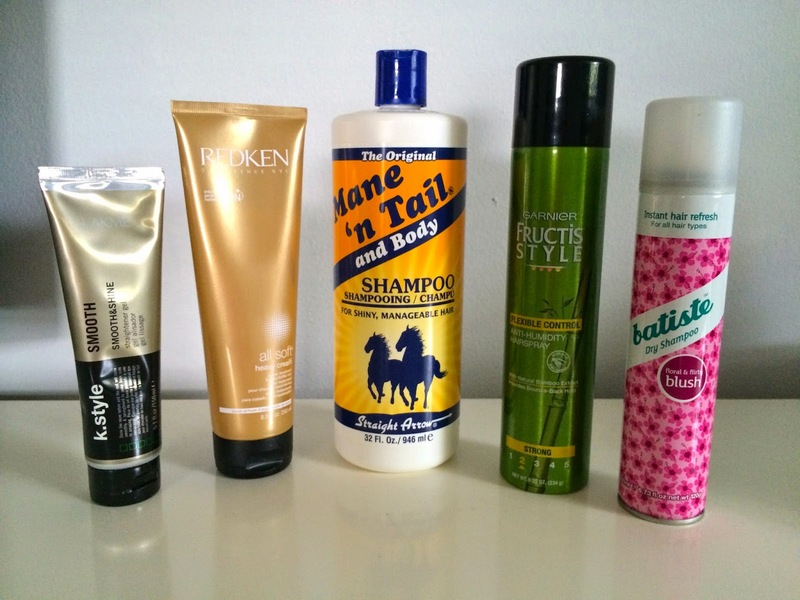 Prep: Mane 'n Tail shampoo is the secret behind my hair strength and growth. I have seen amazing results with this stuff. Condition: Redken All Soft is a leave in conditioner for dry or brittle hair. I was hesitant to use it at first, but I found the trick is moderation. Overdose on this stuff and you'll have an oily mess. Style: Smooth by Lakme is my go-to for blow-drying. It has heat protection and keeps your hair... well, smooth. Perfect for taming waves. Hold: Garnier's flexible control hairspray has been on my shelves for years. I always hated hairspray because it made my hair stiff and sticky, but this stuff is the perfect amount of hold. Keeps the fly aways down without giving you helmet head. Clean: Batiste dry shampoo is a lifesaver. It keeps me from having to wash my hair too often which is torture for frizzy hair. Plus it's perfect for adding a little volume. So there you go my top 5 favorite hair products of all time. What's in your top 5?